At 6’5”, my little brother towers over his peers. A clumsy, lanky kid in ninth grade, Ahmed has always been a little too big for his age. On February 11, 2015, after his morning ritual of brushing his teeth and shaving, he stomped downstairs, trumpet case and backpack in hand. Also in typical fashion, my dad sat stoically in his office, shaking his head over the news. But this time he called Ahmed over. Three young faces flashed across the screen. Two smiling women in hijabs stood next to a tall, jovial-looking man. Yusor Abu-Salha, her husband, Deah Barakat, and her sister, Razan Abu-Salha, were eating dinner when a neighbor knocked on their door. Their neighbor shot them, multiple times, until they laid lifeless by the front door and kitchen of their apartment—just a 15-minute drive from my family’s house. “Why?” my brother, 13 at the time, asked. Over the next few months, I replayed that interaction again and again in my head. I replayed it when I stood quietly at the vigils, recorder in hand. I replayed it when I talked with the best friends of the three victims, and when I nervously approached the parents and pushed a microphone in their faces. As a Muslim-American reporter, I had never covered a story that hit so close to home. I grew up in the same community as Yusor, Razan, and Deah. I watched my best friends fly in from across the country to mourn the three as though they had just lost a family member. I stood at the burial site, surrounded by hundreds, wondering whether I should bow my head or lift my camera. The day I found out about the shooting, a close friend of mine, who's also Muslim, called me. Her voice quivering, she told me what to do. “You have to report this as a hate crime,” she said through the tears. “You have to.” I swallowed and nodded my headed. But the Chapel Hill police, at least at first, had another interpretation. They said Craig Hicks—an atheist who bashed all religion on social media—murdered his neighbors over a parking dispute. As a reporter, I laid out the facts. I told listeners what police said, but I also told them how Nada Salem, Farris Barakat, Hussein Ahmad, and so many other friends and family members felt. 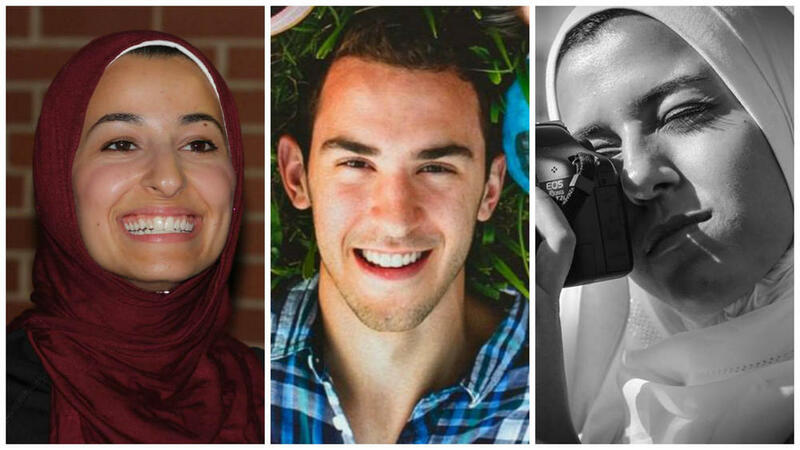 For them, the murders fit into a larger narrative of increasing anti-Muslim sentiment in America. In multiple interviews, I heard the same sentiment: Razan, Yusor, and Deah went out of their way to appease their neighbor, and to attribute their violent deaths to a parking dispute felt trivializing and insulting. Suzanne Barakat, Deah’s sister, summed it up best. “To perform something so vile, so gruesome, so wicked, requires acute dehumanization at the minimum, hatred that is deep and well-rooted,” she said in front of an audience at the storytelling event 'The Moth’ months after the shooting. During the first few weeks of reporting the story, I found myself crying a lot: quietly at my desk, on my drive home, and in empty recording booths at the office. The first time I ever talked about the murders live on the radio, one of my friends commented that my voice felt off, like it was cracking. I hadn’t noticed. I put an immense amount of pressure on myself to churn out meaningful stories that told the story of the victims. But I’m human and I fell short, or at least I felt like I did. I wanted so desperately to capture the madness, profound sadness, and bewilderment those around me felt. I wanted the world to know who Razan, Yusor, and Deah were. At every press conference and event I attended, I was always taken aback by the grace of the victims’ families. They stood, poised and relatively calm, in front of flashing cameras and a cluster of microphones, urging the world to honor their loved ones and the lives they led. In a time of darkness, they radiated positivity. When I covered the first court hearing, I watched the Abu-Salha and Barakat families sit in the same room as the man who killed their children. When it concluded, Mohammad Abu-Salha—Yusor and Razan’s father—got up, turned his head to the potbellied, hunched man who turned his life upside down and called him a “coward.” I couldn’t help but think that my own choice of words would have not been so generous. Over the next year, the families and friends chose to celebrate, instead of mourn. They held food drives in their honor, built scholarships in their names and began turning an ordinary house into a community center aimed at fighting Islamophobia. Last month, on the anniversary of the shooting, I sat down with a few of Razan, Yusor, and Deah’s best friends. They told me how Razan Abu-Salha, who was only 19, gave heartfelt advice and made goofy vines. Instead of clothes, she filled her closet with books. Steadfast in her beliefs, she closely followed world events and loved studying design at N.C. State University. Her older sister, Yusor Abu-Salha, 21, joked, a lot. She listened to rap music, had a penchant for colorful Snapchats, and loved the Los Angeles Lakers. Yusor married Deah Barakat, 23, in a glowing ceremony, six weeks before they were murdered in their apartment. She had just been accepted to UNC’s dental school, where Deah was already a second-year student. Friends described 23-year-old Deah as compassionate and a romantic. Before he died, he stood outside local mosques selling $5 toothbrushes to help raise money for a trip to the Turkey-Syria border. He and Yusor planned to provide dental care to Syrian refugees. They, of course, never made the journey. When I heard Deah’s friends talk about him, my mind wandered to my little brother. Like Deah, my brother is a long-limbed guy with notably large ears and a wide smile. Like Deah, he has an unhealthy obsession with basketball, cares deeply about those in need, and greets everyone he loves with big bear hugs. Born just two months before 9/11, my brother had to grow up fast. The day he found out about their murders, I remember sensing his confusion. He lives in a country where many don’t like his religion (that was made obvious to him when a classmate asked if was carrying a bomb), but something about seeing three role models from his community killed made this feel more real. In the days and months after the shooting, during so many interviews and press conferences, I thought of him—especially when Suzanne Barakat spoke of her own brother, Deah. I cried knowing that she’d never feel his embrace or hear him say “I love you” again. I cried because his death was senseless. I cried because no matter what the courts say about the motive, his death feels like a hate crime at a time of increasing Islamophobia. I cried because in the way Suzanne describes Deah, I’m reminded of my brother. I’m reminded of how Deah, Yusor, and Razan could’ve been anyone else’s family members, including my own. Reema Khrais a reporter for North Carolina Public Radio, WUNC where she primarily reports on education policy. Children are the leaders in multi-faith solidarity against Islamophobia and white supremacy. In 2016, Mary King, once an organizer and photographer for SNCC, and I went to Mississippi to revisit the history that defined the true north of her life.